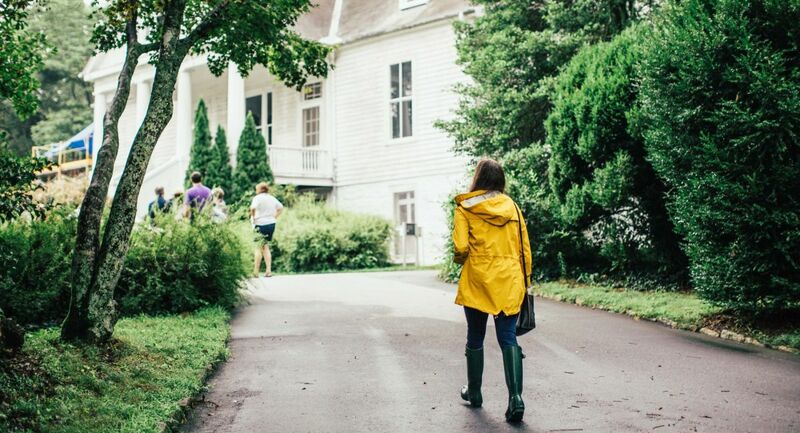 Discover Hendersonville in the Blue Ridge Mountains, known for its beautiful scenery, adventurous outings, acclaimed breweries and cideries, and charming B&Bs. If the urge to get away strikes, choose a destination that offers plenty to do and close proximity to major attractions without having to deal with big crowds. 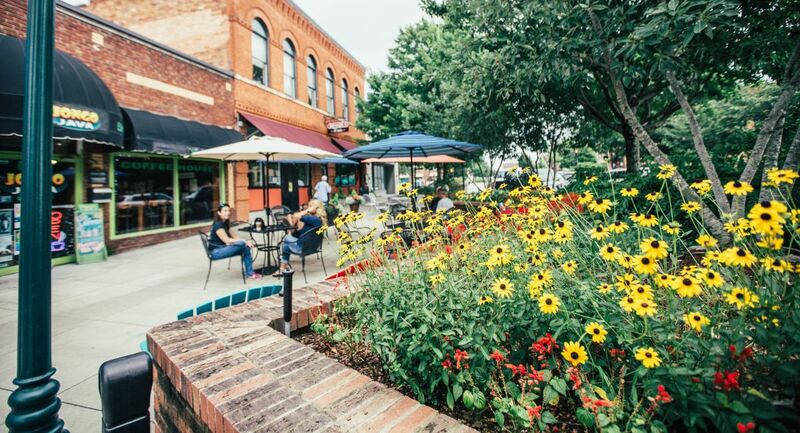 Discover the mountain town of Hendersonville, known for its beautiful natural scenery (hello, waterfalls), adventurous outings (think hiking and kayaking), acclaimed breweries and cideries, and charming bed-and-breakfasts. Take advantage of lodging options in the Hendersonville area that allow you to truly escape. 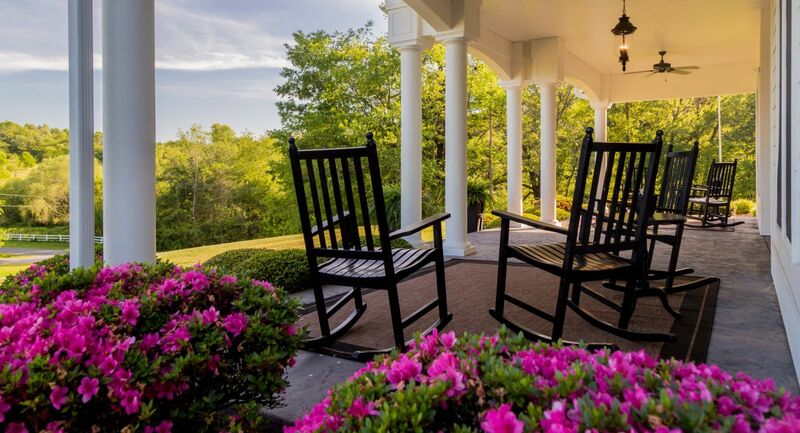 For casual elegance steeped in Southern hospitality, stay at the Bed & Breakfast on Tiffany Hill in nearby Mills River. The complimentary gourmet breakfast served each morning is the perfect way to start the day. If you want adventure with your accommodations, Highland Lake Inn & Resort provides free use of canoes, paddleboards and bikes for an abundance of on-site recreation. Exploration here comes in two main scenes – downtown and mountains – and there’s lots to do in each. Stroll the streets of the historic downtown, and find keepsakes at Carolina Mountain Artists Guild, Dancing Bear Toys and the Hendersonville location of the legendary Mast General Store. Dine and people-watch on the patios of Never Blue restaurant and Black Rose Public House; while for upscale dining, Postero (New American cuisine) and Renzo’s Ristorante are the talk of the town. You’re also likely to encounter a festival going on downtown, ranging from the Apple Country Cider Jam to the North Carolina Apple Festival. The nod to the fruit is because Henderson County produces about 85 percent of all apples grown in the state, which is also why the area is home to Flat Rock Ciderworks and Bold Rock’s Mills River Cidery. Enjoy the taste of freshly made hard cider. Plus, California-based Sierra Nevada opened its East Coast brewery in nearby Mills River in 2015. The sprawling taproom, restaurant and beer garden can entice you to spend several hours here, including the free brewhouse tour. You won’t feel more reinvigorated than when you get outdoors, so explore the mountains and visit iconic landmarks. Jump Off Rock offers a scenic overlook – literally – of what lies ahead. DuPont State Recreational Forest is home to more than 10,000 acres of forest and trails, and its waterfalls are guaranteed to steal the show. Fans of The Hunger Games movie, which filmed here, may recognize Triple Falls. And in the neighboring village of Flat Rock, the Carl Sandburg Home National Historic Site, which is part of the National Park System, offers tours of the late author’s estate, and access to farm land and hiking trails. How would you like to pair your adventure with some rich ecological history? The French Broad River is one of the oldest rivers in the world, and is a haven for water activities. Let Lazy Otter Outfitters guide you on a tour featuring kayaking, canoeing or tubing. Lastly, you can’t stay a few days in this part of the state without heading over to the eclectic city of Asheville, which is less than a 30-minute drive from Hendersonville. Venture out for the day and go on a tour of Biltmore, which features America’s largest private home and the most-visited winery in the country. Or take a rideshare to Asheville in the evening to explore downtown and drop into some of the most acclaimed restaurants and bars in the South.